Lawren Harris, Lake and Mountains, 1928. Oil on canvas. 51 1/2 x 63 1/4 in. (130.8 x 160.7 cm). Art Gallery of Ontario; Gift from the Fund of the T. Eaton Co. Ltd. for Canadian Works of Art, 1948. ©Family of Lawren S. Harris. 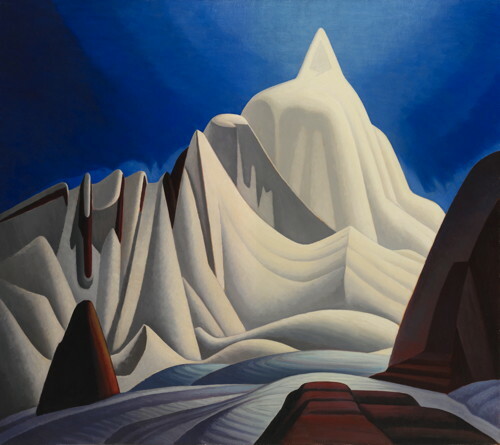 Lawren Harris, Mountains in Snow: Rocky Mountain Paintings VII, ca. 1929. Oil on canvas. 51 11⁄16 × 58 1⁄16 in. (131.3 × 147.7 cm). The Thomson Collection © Art Gallery of Ontario ©Family of Lawren S. Harris. Photo: Michael Cullen. Comedian, actor and musician and modest art collector Steven Martin has made his first foray into art curation with a new art exhibit at the Hammer Museum; The Idea of North: The Paintings of Lawren Harris. Curiously, three artworks by Lawren Harris in Martin’s own art collection are not on display. A major figure in the history of twentieth-century Canadian art and extremely respected in his native Canada, fine artist Lawren Harris has been largely overlooked here in the United States. This exhibition marks the first time since the 1920s that any paintings by Harris have been exhibited here; in 1926 a single painting by Harris was exhibited in L.A. Now we can marvel at a collection of almost thirty loaned artworks — some smaller ‘sketches’ on wood and some larger canvasses — that focus on the transitional period of the artist as he moved from landscapes to abstract symbolism, from the early 1920s to the mid 30s. The works are monumental in impact, and offer a dreamy escape into a mythical rendition of remote lands. Canada, the Arctic and the Rocky Mountains are all depicted in a special way through this remarkable artist’s eye and hand. Lawren Harris (1885-1970) was a founding member of the ‘Group of Seven’ — an assemblage of like-minded artists who pioneered a distinctly Canadian painting style during the early twentieth century. 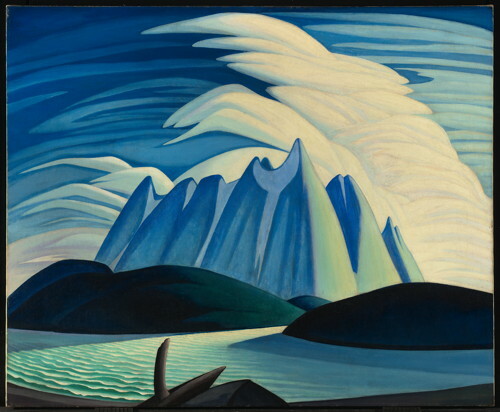 This year the Art Gallery of Ontario (AGO) is partnering with the Hammer Museum to introduce Harris’s iconic landscapes to audiences in Los Angeles and Boston. The Idea of North: The Paintings of Lawren Harris will be the first major solo exhibition of his work to be shown in the United States. Newly opened at the Hammer Museum in Westwood, the show will travel to Boston then will arrive in Toronto in July of 2016. The exhibition is curated by Martin in collaboration with Cynthia Burlingham, Deputy Director, Curatorial Affairs at the Hammer Museum, and Andrew Hunter, Fredrik S. Eaton Curator of Canadian Art at the AGO. At the core of this exhibition are more than thirty of Harris’s most significant northern landscapes from the 1920s and 1930s, drawn from major public and private collections across Canada including the AGO, The Thomson Collection at the Art Gallery of Ontario, the National Gallery of Canada, and the McMichael Canadian Art Collection. 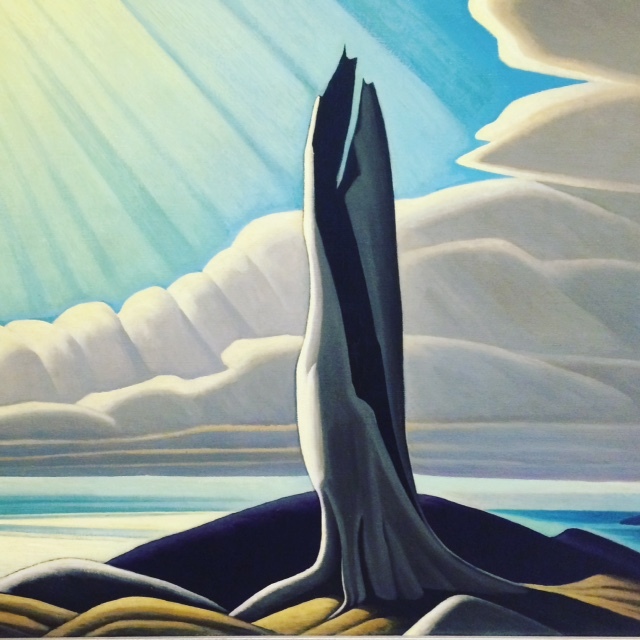 The Idea of North: The Paintings of Lawren Harris examines this defining period and celebrates Harris as a leading modernist painter, an innovator on par with contemporaries such as Marsden Hartley, Edward Hopper and Georgia O’Keeffe. Lawren Harris, North Shore, Lake Superior, 1926. Oil on canvas 40 1/4 x 50 1/8 in. (102.2 x 127.3 cm). National Gallery of Canada; Purchased 1930. ©Family of Lawren S. Harris. Photo ©NGC. 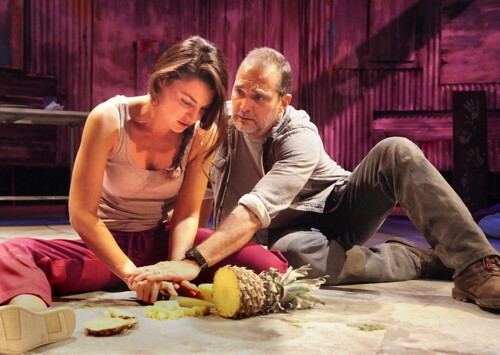 Photo by Pauline Adamek. On view at the Hammer Museum from October 11, 2015 to January 24, 2016, the exhibition will tour to the Museum of Fine Arts, Boston (March 12 – June 12, 2016) followed by the AGO (July 2–September 11, 2016).